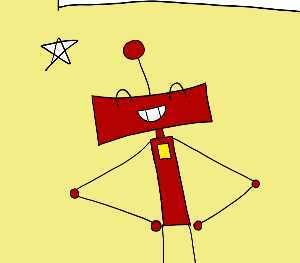 This hilarious story about a little boy who builds a malfunctioning robot is a great choice for reluctant readers. Nestled within childlike illustrations is a story full of richness. 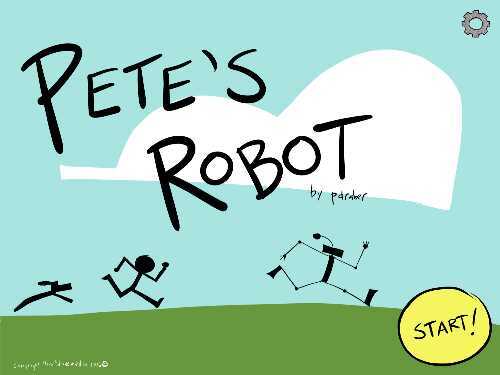 Pete's Robot stars an inventive little boy who decides to build a robot. With the help of his trusty dog Spot, Pete assembles the robot. 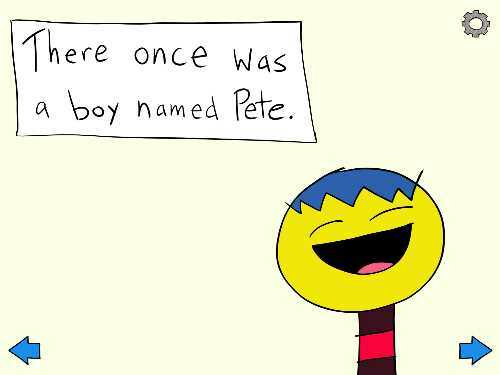 Unfortunately, Pete forgets to put in a part before the robot takes off, wreaking havoc all over town. When Pete discovers that his invention is missing its "heartdrive," he chases after it. This hilarious adventure, filled with clever interactions and a wonky robot, will delight children. When the robot is malfunctioning, it does silly things like entering a dance contest, baking mud pies at the diner, and grabbing the mailman's pouch. Readers add to the mayhem by shaking their device to make the mail scatter over the scene. 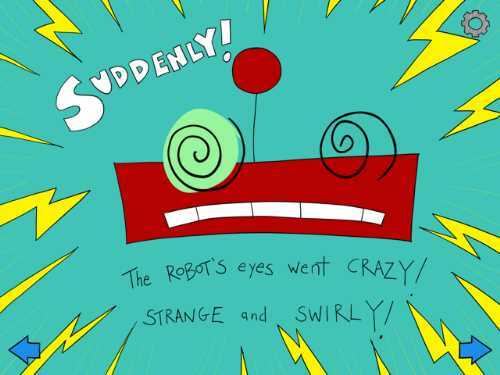 And when they touch the robot's eyes, the orbs swirl, creating a psychedelic effect. By fixing the robot, Pete creates a machine that is heroic and kind; and he is proud of how it helps others. 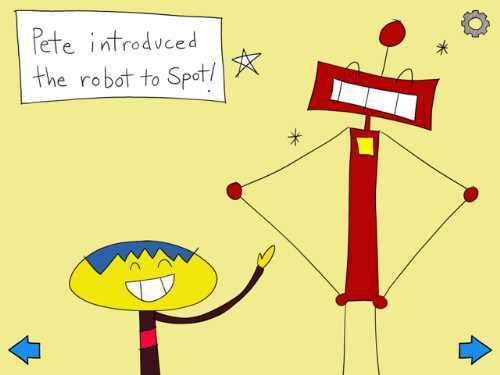 The book ends with Pete, Pete's dog Spot, and the robot forming a band which the reader conducts by tapping the musicians on and off. This story is filled with comic book-like sounds and lots of exclamation points. Every page has a high octane interaction that is zany and silly. Touch Pete, and his expressions change wildly. Tap the robot, and his expressions cycle through wacky combinations. This is a zonky adventure that all children will enjoy, and it will have particular appeal to those high energy kids who don't normally like to read. Kids can choose to listen to three different narrators (two male and one female), or they can turn off the narration to read the pages themselves. The words don't highlight as read, but the talk bubbles will repeat if touched. Pete's Robot delivers an important message about why we all need to lead with our hearts. When the robot doesn't have his "heartdrive," he is unhelpful and out of control. 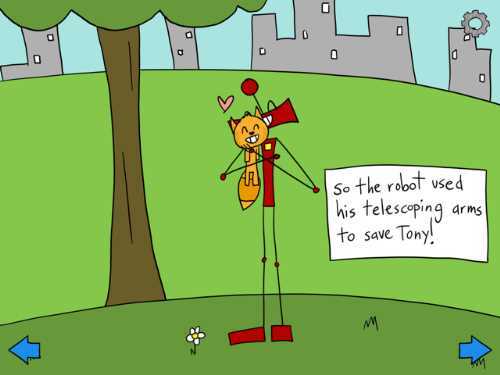 When Pete puts in the heartdrive, the robot has compassion for others and turns into a hero by helping others. Pete's Robot is a good fit for little kids who love to build things. It is so exuberant and exciting that it might corral those high-energy children who don't like to stop moving to read. This kids' app review of Pete's Robot was originally published on Feb. 15, 2014. It was updated on March 15, 2016 to reflect its new graphics and interactions. Jinny Gudmundsen wrote this book app review.